"Hedges have edges and rushes are round," explained our Audubon Society guide, Peter Van Voast, showing us examples as we followed him along the trails of the Wetherill Nature Preserve in the spring of 2004. He identified trees and plants thriving in their natural state in the Preserve and also pointed out evidence of a beaver that had feasted on a damaged tree. What surprises new visitors are the Preserve's number of trails and its size, and also the variety of bird life. Waterfront vistas across Cozy Cove sparkle in the sunshine. A kingfisher sometimes chatters from the water's edge or an eagle will land in the lily pads, dipping its wings for a bath. The Preserve offers surprises at any time of the year, but bird life prevails especially in the springtime. Song sparrows and chickadees sing and flit above in the trees. The quiet observer will find mother robins sitting on their nests in low shrubs and trees behind a cozy screen of leaves. 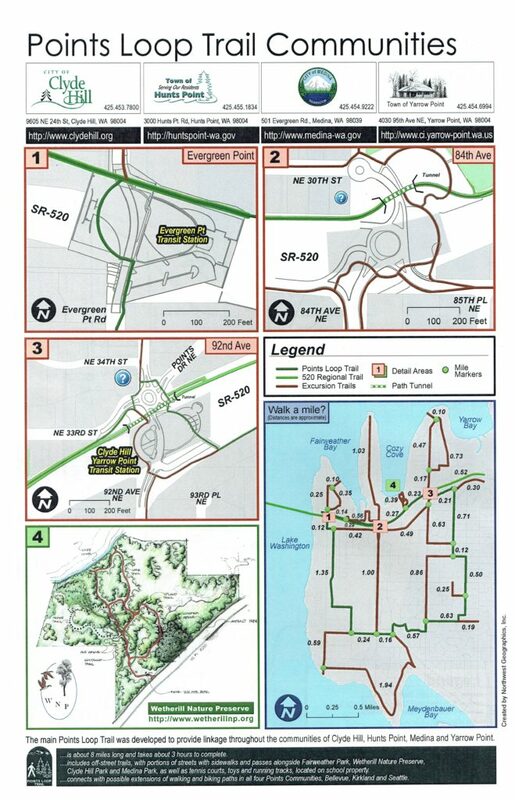 The Wetherill Nature Preserve, located between Hunts and Yarrow Point, can be accessed from the bus stop via the SR 520 trail/ or the Points Loop Trail. The Preserve is a sensitive area to be enjoyed, but protected, and is open all year during daylight hours. In the Wetherill Nature Preserve the visitor sees the conscientious attachment to the land of several generations. In 1989 Marjorie Baird and her sister Sidonia Foley bequeathed sixteen acres of prime property - originally purchased by their grandfather, Seattle financier Jacob Furth - to the towns of Yarrow Point and Hunts Point to protect, in perpetuity, the land from development and to preserve its wildlife and native plants. The sisters dedicated the Preserve to their mother, Sidonia Furth Wetherill, and their father, Army Colonel, Alexander Wetherill. Marjorie Wetherill Baird died October 30, 2004, at the age of 92. One of Marjorie's daughters, Sidonia St. Germaine, is a Commissioner for the Wetherill Nature Preserve Board. The Town recognizes resident David Bergey for his trail blazing efforts to make Wetherill Nature Preserve a place for the community to enjoy. 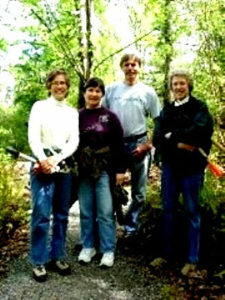 For more on the history of the Wetherill Nature Preserve, consult A Point in Time, A History of Yarrow Point, Washington, 2002 and http://www.historylink.org/essays/output.cfm?file_id=4212. Click here to contact the Yarrow Point Town Hall about the Wetherill Nature Preserve. Community Day of Giving – Sunday, May 5, 1 – 4 p.m.
Friday from: 8:30am to 12:00pm.